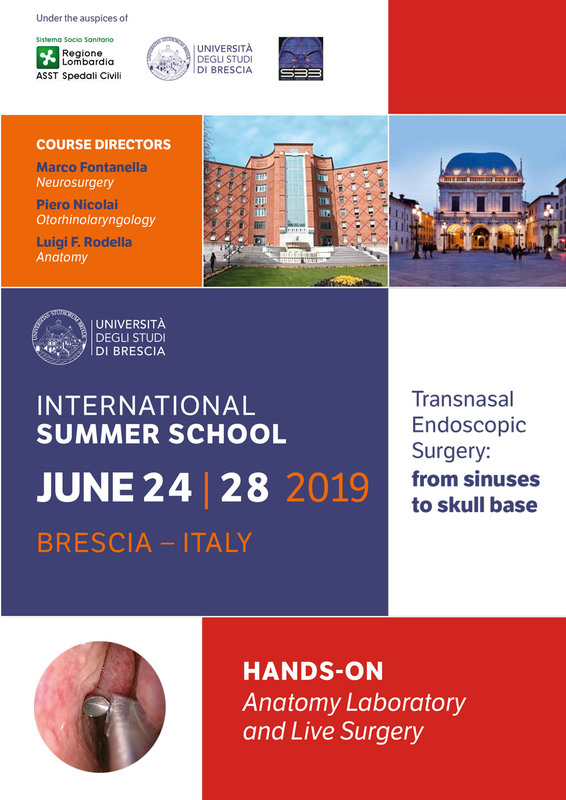 which will be held from June 24 to 28 2019 in Brescia, Italy, as attachment the save the date. Aim of the course is to offer an overview of the applications of trans-nasal endoscopic surgery, starting from simple procedures performed under local anesthesia to more extensive operations adopted for inflammatory disease, benign and malignant sino-nasal tumors, skull-base diseases, sellar and parasellar lesions, down to the clivus, nasopharynx and craniovertebral junction. The course will provide a hands-on session, followed by an interactive live surgery section. The first three days will be dedicated to the endoscopic endonasal dissection of injected, fresh frozen specimens. Each working station is complete of endoscopic skull base surgery equipment, as well as CT-based navigation. Two participants and one observer will be assigned to each station and will be supervised by at least one faculty member to allow for a personalized tuition. Each step will be preceded by 3D-HD videos explained by the faculty members, as well as demonstrations with 4K technology. The following two days will be dedicated to live surgery, with three running operating rooms, in which different operations will be shown and discussed step by step. As well as watching the operations from the connected meeting room, participants and observers will have the chance of observing surgery directly in the OR. 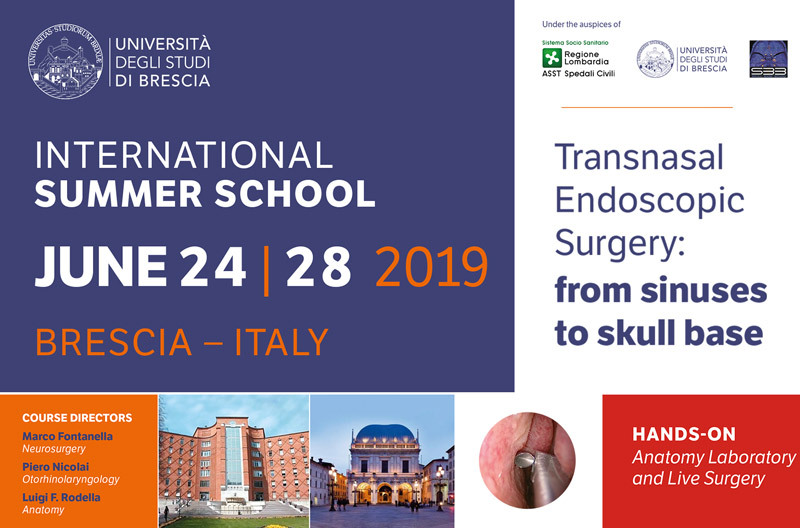 Lectures will be provided by the local and international faculty, all recognized leaders not only in the fields of endonasal endoscopic surgery and endoscopic skull base surgery, but also in other essential specialties, such as radiology and pathology. 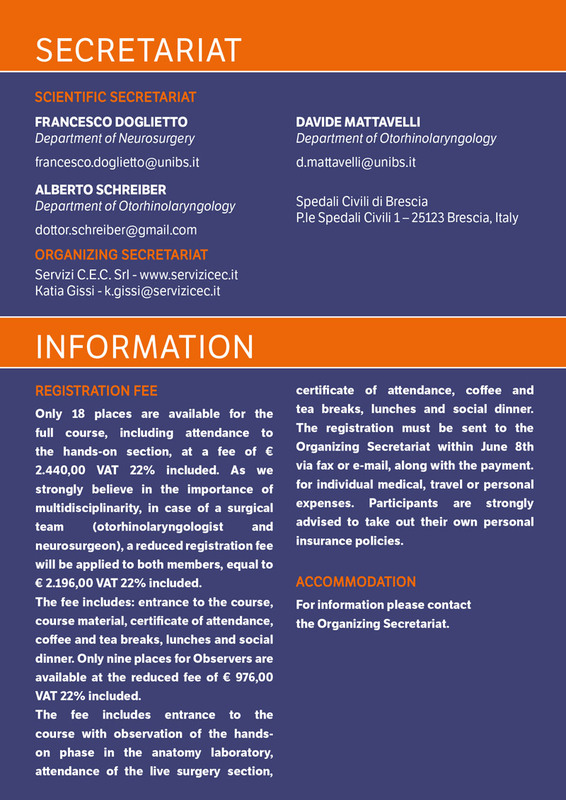 The course is addressed to otholaryngologists and neurosurgeons, according to the aim of multidisciplinarity the course encourages. There are 18 places available as “full course” (which includes attendance to the hands-on section) and 9 places as “observers”.